Workshops with Aletha Solter, Ph.D.
Workshops by Aletha Solter, Ph.D. This page describes Aletha Solter's workshops. The certified Aware Parenting instructors (in 19 countries) also offer workshops, lectures, and support groups. Please contact these people directly for information about Aware Parenting activities in their area. 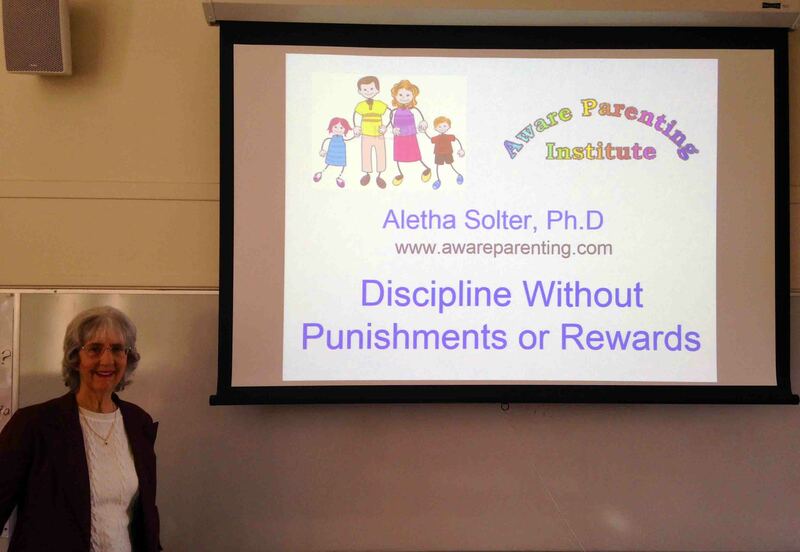 Aletha Solter, PhD, is a developmental psychologist, international speaker, consultant, and founder of the Aware Parenting Institute (www.awareparenting.com). Her books have been translated into many languages, and she is recognized internationally as an expert on attachment, trauma, and non-punitive discipline. The titles of her books are The Aware Baby, Cooperative and Connected (a revised edition of Helping Young Children Flourish), Tears and Tantrums, Raising Drug-Free Kids, and Attachment Play. Self-paced pre-recorded workshop: "How Children Heal From Stress and Trauma." Note: The AATBS website is accessible only to residents of the United States. This information is updated frequently. Please check back again soon. October 2019: Workshops in Istanbul, Turkey. February 2020 (date to be determined): Full-day workshop in Santa Barbara, California. "Helping children heal from stress and trauma." Stress and trauma early in life can alter children's neurobiological systems and lead to anxiety, aggressive behavior, hyperactivity, attachment disorders, sleep problems, learning difficulties, depression, and physical illnesses. Luckily, children know how to heal from trauma if we give them the opportunity. You will learn how to create an atmosphere of emotional safety in which babies and children can restore emotional health. The focus will be on facilitating children's spontaneous stress-release mechanisms of play, laughter, crying, and raging. This workshop is of interest to parents and other caregivers, therapists, psychologists, teachers, social workers, and health professionals. Aletha Solter offers talks and workshops for parents and professionals on a variety of topics based on the philosophy described in her books. These talks and workshops range in length from a two-hour presentation to a full-day workshop. In addition she is available to give one-hour presentations for organizations as a conference or keynote speaker. She can do all of her presentations in either English or French. She can also give some of her two-hour lectures in German or Spanish. Aletha has delighted parents and professionals in 17 countries with her informative and entertaining presentations. If you wish to organize a presentation in your area, please contact her at (805) 968-1868, or by e-mail at solter@awareparenting.com, and ask for her workshop information sheet. Click here for more information about Aletha Solter. "I would like to say a HUGE thank you to Aletha for making the Aware Parenting conference in London possible. It was absolutely amazing. I was moved by the amount of people who came to hear her speak, especially those who travelled so far to come to London. I was overwhelmed by the warmth and kindness shared among the attendees and blown away by the content of Aletha's workshops." "Thank you for your great presentations. The feedback from your talks was uniformly glowing. You're a pro!" "Thank you so much for your workshop. It was incredibly inspiring to me, and I know also to the others who attended." "As a mother and therapist working in Johannesburg, South Africa, the workshops were a reminder of how crucial it is to keep our children's spirits intact, right from the beginning. I was reminded of so many things, but especially the importance of connecting, holding and unconditionally allowing our children to express what they feel. Thank you for travelling so far to share your teachings with us." "Thank you so much for your time with us in Sedona. Feedback from parents continues to come in on how helpful the workshop was for them, and how much they valued what you offered. I am very pleased to say that these families have told me that they are already putting to use your suggestions... The moms have expressed how thrilled they are to have partners who now understand and are genuinely excited about putting Aware Parenting practices to work within their families. What a truly valuable gift Aware Parenting is in a world in which we have lost touch with our innate nurturing instincts." "I am so grateful for you coming to Australia to spread Aware Parenting further round the globe. In particular, I was so impressed with your presentation style and how you found a way to include humour, research, your own experiences, practical suggestions, and also the experiences of the participants with their own children as well as with their parents. Your workshops reconnected me to the deep trust in each baby and child to do what they need to do, given enough aware attention." "Congratulations for your elegantly clear presentation at the San Francisco Congress." "I have gotten such wonderful feedback from those who attended the Florida workshops. You have not only changed our lives but the lives of many who attended...We feel so much more understanding, knowing now how our son will attempt to heal from various stresses and traumas. Instead of feeling overwhelmed, perplexed or angry, we feel more calm and thrilled to have some parenting tools to help him heal. The patience this kind of knowledge gives us is just amazing. It has also helped us to understand ourselves so much better. " "I had the occasion to meet people who told me that they appreciated your talk in our Swiss village very much. As for myself, I was touched by the simplicity with which you presented the subject and gave your examples. I thank you for this model of authenticity that spoke to the heart of everyone." "The people who came to your workshop in Geneva had nothing but good things to say about it. One woman told me that her husband said she was so much calmer and happier, and he asked what was going on. She replied that she felt so much different about her little ones crying that it improved her whole attitude." "Your talk in my town in Austria was wonderful! The audience was fascinated by your method." "I knew many of the 200 people at your Brussels workshop and people have been calling me to give me their positive impressions. Thank you for having opened up this enormous field of exploration and help for families. I wish you all the best, and specifically to reach more and more people in order to revolutionize our way of raising children. This is what a revolution is, isn't it? It's not always with noise and violence. Your actions are a part of this subtle revolution that I hope will make humanity more human, more aware." "Your workshops here in the Netherlands were a real success...I liked your illustrations, the content, and your enthusiasm." "Wow! The San Francisco workshop was a fabulous success in all respects. You are a phenomenally experienced, knowledgeable, and charming speaker, and everyone learned a lot. Thank you so much! "Mexican parents were very happy to have you in Mexico. You opened hearts for respect and love for children." "Very informative with concrete, realistic examples." "Extremely knowledgeable and easy to listen to." "Very personable. She related a lot of her personal experience." (From the UK) "I feel privileged that I could attend your workshops in London and hear directly from you about your work and your experiences with children and parents. I valued your empathetic and realistic tone. I felt nurtured." (From Santa Barbara, California) "Thank you so much for the super helpful workshop yesterday! It felt so good to feel renewed in my confidence and clarity about being with my kids in a way I feel better about already. Thank you, thank you, thank you! I will be keeping my eyes peeled for another opportunity to soak up your wisdom and sweet testimonies. I so loved your stories, and the way you hold children in your heart. Thank you for this beautiful work that you do and share." (From Santa Barbara, California) "After the advanced workshop, a few more things clicked for me, and I have been really encouraging my daughter (age two) to get more feelings out... Lately, she has been telling me, 'Mommy is better mommy,' and 'Mommy is new mommy.' I thought I was doing pretty well before, but apparently she has noticed quite a difference. So I am grateful to you." (From South Africa) "By the end of the workshop in Johannesburg I made an internal commitment to never spank my sons again. For the first time I could understand that such authoritarian methods are actually disrespectful and harmful to children." (From France) "Your workshop in Paris was an outstanding experience to me. I really enjoyed attending! I was surprised how openly participants responded to your workshop and discussed their own childhoods among each other." (From Spain) "Many thanks to Aletha Solter for everything she has taught us in order to respect all the needs of our children." "The workshop has helped me become a better human being in all the facets of my life as a therapist and mother." (From Canada) "I am a child protection social worker in Canada. I recently attended two days of workshops with Aletha. Not only am I preaching her words of wisdom to all my clients who struggle with parenting, but I have changed my own parenting style. No more punishments or rewards for my kids....just love, patience, guidance and understanding. Thank you Aletha!" This page was last updated on February 12, 2019. Copyright © 1996 to 2019 by The Aware Parenting Institute. All rights reserved. No part of this web site may be reproduced or transmitted in any form or by any means, electronic or mechanical (including copying to other web sites, and including translations), without written permission from Aletha Solter.